As you know by know, I was hitchhiking around Hokkaido for a while. Thus I spent much time driving in cars on the roads of Hokkaido. The first thing I noticed was the abundance of wonderful nature views, wherever you go, as the streets cut like veins through a body entirely made of ancient magnificent nature. However the second thing I noticed was the military. Strictly speaking, I need to say 自衛隊 Jieitai or Self Defense Forces SDF, as Japan is by constitution not allowed to have a military. I fear in average every second or at least third car, was a vehicle from the SDF, troop transports, tanks, MG-jeeps and the like. After seeing that for a while I actually got afraid. Seeing military moving within the country is not so strange, even in Germany, but not in such numbers. Also in the rest of Japan I have never seen a single vehicle. So I asked my driver "Are the Russians coming?" pointing at the SDF vehicles passing by. He replied "Oh no, it's always like that, don't worry". The reason for the high presence of the SDF in Hokkaido is obvious: Russia is in War with Japan. Yes I am not kidding legally both countries are in war. The war is not a new war, that you missed in the news, but an old war you have forgotten, or are to young to remember from the news: World War 2. After Japan lost the war, the situation prior to Japan's expansion policy was tried to be restored by Potsdam Peace treaty including islands north of Hokkaido (Etorofu, Kunashiri, Shikotan and the Habomai Islands), but excluding the Kurile islands and Sakhalin. Russia had occupied all these islands during the war and now refused to give any of them back (actually the conflict even dates further back, but let's start here for now). Indeed they deported all 17.000 Japanese inhabitants forcefully to Hokkaido until 1949. 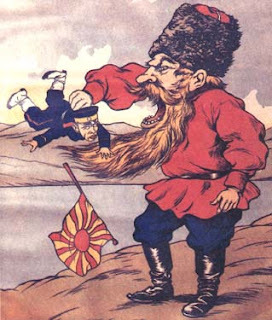 Thus Russia refused to sign a peace treaty with Japan and kept the northern islands. This problem is still unresolved, and both countries claim possession of the islands thus continuing the war, even if it is more fought like the Cold War. And that is why the SDF is so present in Hokkaido. Especially now, after seeing Russia's action in Georgia, it is only natural for the SDF to grow tense and careful, be the threat real or not. If Russia would invade Japan, they could claim that they have no peace treaty with Japan what so ever. So let's see why both Russia and Japan claim possession of the northern islands, and why the conflict is still unresolved. It actually dates much further back then World War II, as you might have guessed by now. 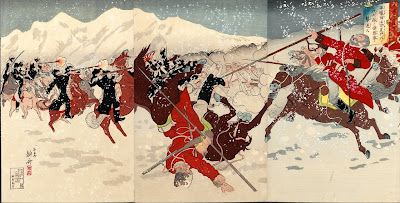 It starts in 1635 when the Matsumae clan, starting its dominance over Hokkaido, ordered a map over Hokkaido and its northern islands. 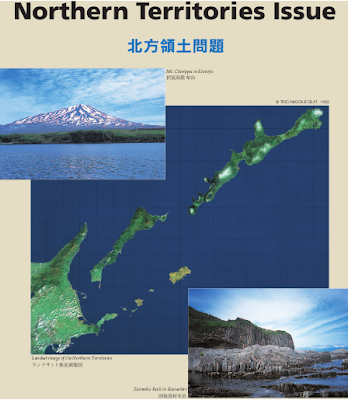 This map contained all the islands in conflict: the northern islands (Etorofu, Kunashiri, Shikotan and the Habomai Islands), the Kurile islands and Sakhalin. 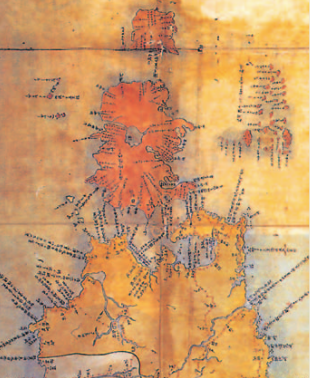 Russia first explored the Kurile islands in 1711 and created a map in 1721 where it at least denotes the northern islands as Japanese territory. With this prequel Japan and Russia peacefully negotiated a peace treaty giving the northern islands to Japan, and the Kurile islands to Russia in 1855, when Japan was forcefully opened by the west and its time of isolation policy ended. 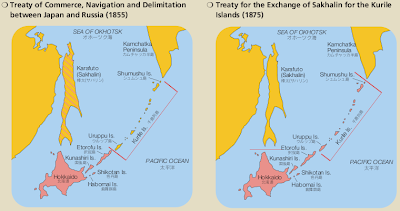 The treaty included that Sakhalin can be peacefully inhabited by Japanese and Russian people. 20 years later a new treaty was agreed upon, that exchanged the Kurile islands to Japan for the undisputed dominance over Sakhalin to Russia. In World War I, Japan joined the Allies against Germany, but before that it fought its own successful war against Russia. 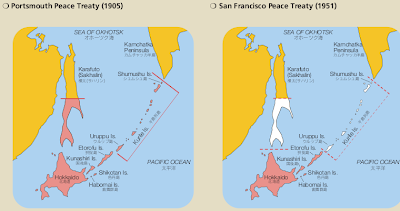 The outcome was a peace treaty in 1905 (Portsmouth Peace Treaty) after Japan had conquered the southern half of Sakhalin. In World War II, Japan sided with the Axis against Russia and America and lost. It was agreed that Japan had to give back all territories acquired during the war, which included for example the Philippines, Korea, and Manchuria in China. The claim on the Kurile islands and on Sakhalin were to be given up, but the northern islands remained under Japanese governance. This was written down in the San Francisco Peace Treaty 1951. The Soviet Empire refused to sign this treaty, because it conquered all islands north of Japan and intended in keeping them. Ever after that peace treaties were negotiated but never agreed upon. In 1956 a treaty was proposed that after peace was reached, half of the northern islands should go to Japan and half to Russia. However since until today no peace was signed, this never happened. In 1960 the Soviet Empire refused to acknowledge that there even exists an issue about the governance of the islands and made all negotiations come to a stand still. In 1991 Mikhail Gorbachev visited Japan and it was mutually agreed to finally resolve the ongoing war and sign a peace and friendship between Russia and Japan. The end of the same year the Soviet Union collapsed. 1992 an objective committee was called to gather objective facts about the history of the conflict, a big step towards resolution. 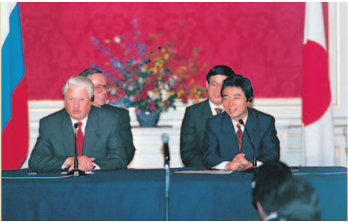 In 1993 Boris Yeltsin visited Tokyo and in 1997 Ryutaro Hashimoto visited Moscow, and both agreed to sign a peace treaty by the year 2000. But it never happened. 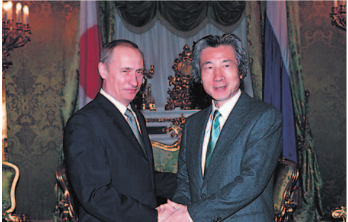 In 2001 and 2003 Vladimir Putin and Junichiro Koizumi met again and again agreed upon that a peace treaty should be made soon now. The conflict is really difficult, as both nations are stubborn to having right to the islands and it is difficult to make an objective decision. Also another problem is, that there is no third power both nations would trust to make an objective decision. 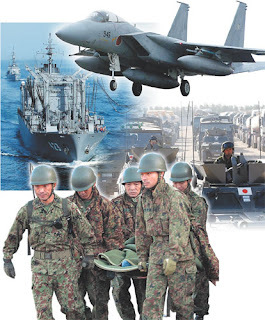 The NATO would obviously favor Japan, as Russia who recently left the NATO proved. And the UN, while being representative of all the countries in the world, has no power to enforce a made decision and thus such a resolve would be as vain as the agreements on making peace treated for the last 60 years.